This time of year when the days are short and the nights are cold, I turn to claypot cooking for warmth and comfort. Be it claypot bak kut teh, claypot chicken rice, stews, or soups, claypot somehow adds that earthy aroma to the dish I cook and make the food a lot more appealing just because it’s cooked and served in a claypot. I have many recipes to share when it comes to braised tofu–there are just endless possibilities. You can play with the different protein, be it pork, chicken, or seafood. You can also throw in different vegetables and mushrooms you like–napa cabbage, carrots, bok choy, dried shitake mushrooms, button mushrooms, enoki, and the list goes on. And then there is the sauce: soy sauce, oyster sauce, with beaten egg, or without it. As I said earlier, endless possibilities and all delicious. For more menu ideas, please click here for Rasa Malaysia Recipe Index. 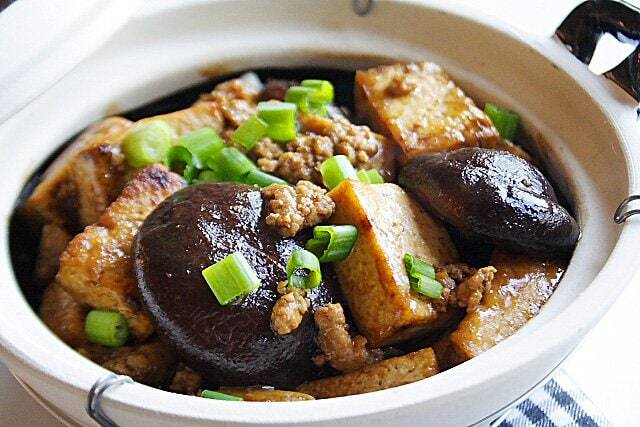 Firm Tofu with Mushrooms - ground pork, shiitake mushrooms, dark soy sauce, scallion, garlic. Heat up the claypot and add 1 tablespoon of oil. Stir-fry the chopped garlic until aromatic and toss in the ground pork, do a quick stir before adding the mushrooms and the fried bean curd. Add all seasonings and water and cover the claypot with its cover. Lower the heat to low and let it braise for 15 minutes. Before serving, add in the corn starch mixture to thicken the sauce. Toss in the chopped scallion and serve immediately. Oooh, that’s one thing I don’t have (well – actually, that’s one of many things I don’t have) a claypot! I love that dish and it looks incredibly delicious in the photo. Yum. You’re right, it’s perfect for a cold evening. That is serious comfort food. :) Beautiful. I don’t have those clay pots, but it sounds like a great way to warm up! I don’t have a claypot as well, but this and the chicken rice is next on my list to try. I’m seriously hungry! This looks delicious! It never occurred to me that you could braise tofu. Tofu is so versatile! great recipe… i have to try that in the clay pot over the weekend :) looks fabulous. Looks wonderfully warming. Have added ‘ABC Kecap Manis’ and a claypot to my never ending shopping list now. :-) I hope I can find both these things in an Asian store. That dish looks restaurant-quality. But I bet it tastes even better. If I go out to eat and get claypot, it’s usually with beef tendon or with seafood. Tendon and squid just call out to be braised in this way. Every time I see clay pots in my Asian grocery, I’m so tempted to buy one, but I really don’t know how to cook with it. This recipe is a great start! Hi RM! 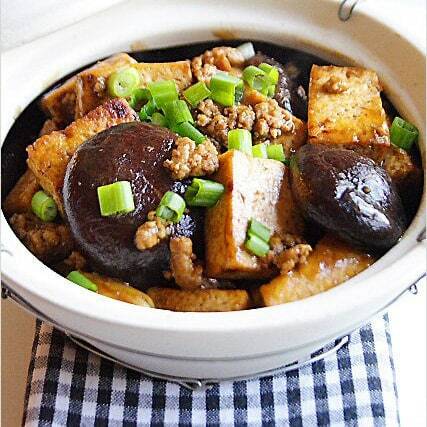 your claypot tofu looks so delish! I love tofu dishes of any kind and this is really making me hungry! This looks really good! I have always wondered about clay pots. How do you cook with them? Do you place them directly on the stoves burner? yum! What a great idea. I used as similar recipe base before and make braised siew yoke with mushrooms instead. Can’t wait to try this as well. Thanks for sharing. I should never read your blog again when I’m hungry! 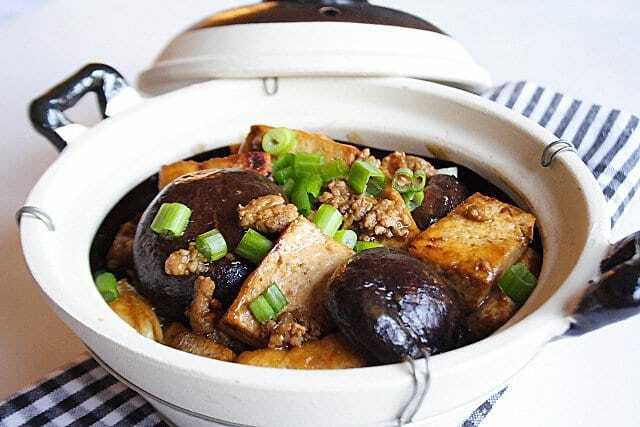 I love braised bean curd with mixed vegetables in the claypot!! yum! I don’t have a claypot! And the winter in Taiwan is not as cold as in the US. You just inspired me to try this since the ingredients are so simple and the combination with tofu can be so forgiving. Just in time for me, esp when I’m still trying to find ingredients in the supermarket here in Taiwan (the choices for ingredients are not as great as in the US, IMO). this looks beautiful in the claypot. great dish, i’m sure it’s delicious. 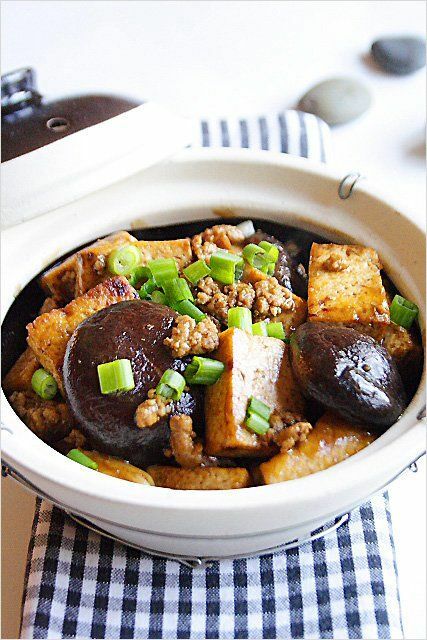 RM – I love claypot cooking and your photo is making me hungry! What is more comforting than tofu made this way? You’ve inspired me to pick up my claypot. And thank you for all your good work with Menu for Hope. I think it’s going to be another successful year. Ohhh I love this!! Tofu and mushrooms are two of my favorite food. I’m bookmarking this and will try it very soon. Thanks! Oh no! I don’t have a claypot. Do I need to change anything when making this? I made your braised bean curd with mushrooms after I bought the claypot and they are so divine! Your breaised bean curd with mushrooms recipe is definitely a keeper. Rasa M, you are such a genious. I found your blog by accident (when I was searching for beef rendang recipe via google), but you’ve got all the Chinese recipes that I wanted. And I liked the fact that the ingredients are easy to find… oh I think my partner will love me even more when I surprise him with his favourite Chinese food at home. Here’s my attempt. Hope you don’t mind me referencing you? Nice recipe – I need to find an authentic Clay Pot! This looks absolutely amazing!!! When living in Amsterdam I often visited a Japanese restaurant and always had this dish aswell with stuffed trout and gyosa’s….even thinking of it makes my innerself crave!!! Will make it this comming monday!! And also I want to say: I ADORE your site!!! I quite enjoy your website, but this is the first time I have tried one of your recipes. I lived in China for a while and have started cooking without animal products, and am about to have a Lunar New Year’s party, so I need to expand my repertoire and chose your braised tofu recipe (minus the flavorful pork and kecap manis). This is also the first time I’ve fried tofu, and mine did not fry up golden even after a long time. I did more than pat the water out; I pushed down fairly hard with the cloths. Could you suggest how to improve the frying? I was using canola oil which has not been treated to increase the smokepoint. I just tried to cook this without a clay pot! Delicious! I just made this and it was super delicious.! It’s quick, simple and easy. The only thing I changed was swapping the firm tofu for soft tofu. I tried to clicked on the recipe bit it said page not found? So sorry it’s fixed now.